Draw samples from a Gamma distribution. Samples are drawn from a Gamma distribution with specified parameters, shape (sometimes designated “k”) and scale (sometimes designated “theta”), where both parameters are > 0. 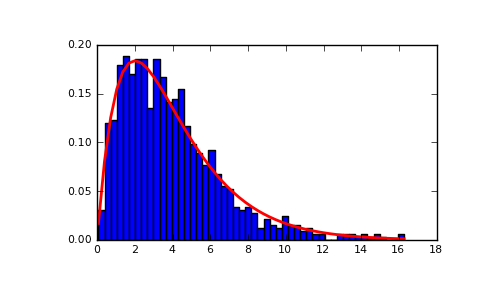 The shape of the gamma distribution. The scale of the gamma distribution. Default is equal to 1. Returns one sample unless size parameter is specified. probability density function, distribution or cumulative density function, etc. where is the shape and the scale, and is the Gamma function. The Gamma distribution is often used to model the times to failure of electronic components, and arises naturally in processes for which the waiting times between Poisson distributed events are relevant.